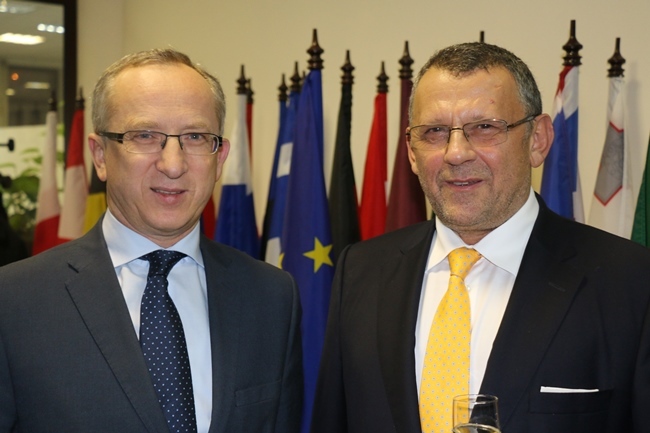 On Thursday November 12, Head of Mission, Kalman Mizsei held a reception for representatives of the Presidential Administration, Ukrainian government, Law enforcement and Rule of Law agencies, international organizations, embassies, civil society and think tanks. The occasion was Mr. Mizsei’s departure from the Mission due to the end of his mandate as the Head of ‪EUAM at the end of November. The Head of EUAM from his side underlined the need for the country to proceed with the civil security sector reform and expressed his gratitude to the interlocutors of the Mission. “I’m grateful for the trust and the fruitful cooperation with all our partners. EUAM has been engaged on many levels, from a technical to a political, to contribute to the success of the civil security sector reform. It is not only that I will remain a friend of Ukraine. I will continue to contribute to the success of this wonderful country and its people”, said Kalman Mizsei.